Edit the description of your YouTube video. Step 3: In the description, type out your YouTube timecodes. For example, if you want to jump to two minutes into your video, you would type out 2:00. Here is an example of how I recommend typing out your YouTube timecode markers. Step 4: Once you’re finished, click save. You now have a link to a specific time on a YouTube video. When one of your YouTube subscribers clicks on the time you listed, they will be taken to that specific time in the video. A hat tip goes to Jenae Kaska who was using this feature in one of her videos. If you have really long YouTube videos, this is a handy way to let your subscribers see what is in the video. This is also great way to increase YouTube engagement because you are directing people to the exact part of the video you want them to watch. This way, when someone needs to see a certain part again. Instead of making them watch the entire video, they can now jump to a specific time on a YouTube video. Do you plan to start adding a link to a specific time on a YouTube video? Let me know what you think about this feature. This video is private. I cant view it. @disqus_EaKBMmEa3q:disqus, must have been a hiccup with YouTube. Can you try the video again and let me know that it is working for you? It’s pointed out that “this YouTube video trick works great when you’re sharing links to your videos on Facebook, Twitter, or on your website,” I have found that it does not, in fact, work when used in a blog post on your website. 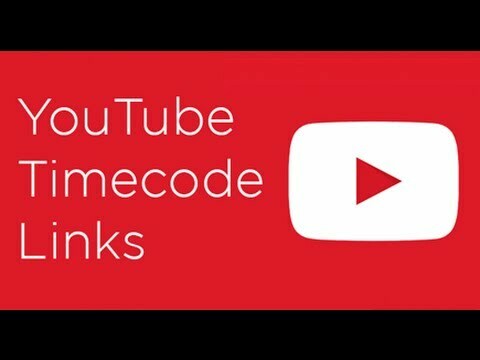 A YouTube URL included in a blog post, even when it’s formatted to include a specific timecode, hyperlinks to the beginning of the video. The formatted URL does, however, work well in Twitter and in Facebook, according to my tests. If I’m missing something, please let me know. Can you direct me to a blog post in which a timecoded-URL works as you describe? This would be a wonderful thing to learn how to do. Debi Davis, I just tried it using the URL I mentioned in this post. The video immediately stared playing at the 20 second mark – this was from a desktop/laptop. This is a trick I use all of the time for videos I share for work. Can you share a link to a URL you are trying to create a link for – and what time you want to link to? Happy to take a look and help with the URL.